For the past few days,* I’ve been attending the biannual historians’ convention in the metropole on the Elbe. This year the overarching theme of the event was “Glaubensfragen” (questions of belief), and I booked my ticket anticipating a lot of religious history. I wasn’t disappointed, either. 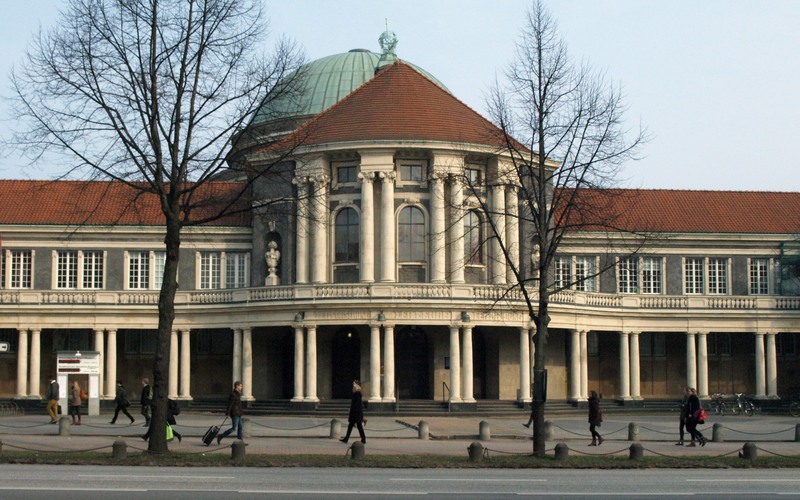 At the turn of the twentieth century, Hamburg had a thriving Jewish community. The Institute for the History of the German Jews (IGdJ) has spent fifty years supporting research on the history of Jews here and elsewhere in Germany, and yesterday evening they launched a new collection of digitized sources for which I had the pleasure of doing a variety of translations. It gave me quite a thrill to be at the event when the “corks flew” and to meet several people with whom I had thus far only had the pleasure of exchanging friendly emails. You can access the collection here, and I’ll be adding a link to my portfolio page soon. The project is ongoing, and I hope that my schedule will allow me to continue participating by translating future documents. The IGdJ also organized a tour of the Grindel neighborhood adjacent to (and incorporated into) the modern university campus; there were about 25,000 Jews living in Hamburg in the 1920s, and about 5,000 of them lived in this neighborhood. Needless to say, these numbers were more than decimated during the era of National Socialism, and only about 600 Jews lived there in the decades following war. From a 50th anniversary to a celebration of 500 years: this afternoon I attended a podium discussion in the Jakobikirche about the upcoming anniversary in 2017 of Martin Luther’s posting of the ninety-five theses. Germans are divided about how and to what extent this event represents a turning point which should be celebrated. In the grand narratives of historiography which have been more or less deconstructed by academic historians, Luther’s protest against the sale of indulgences has been seen as the birth of modern Enlightenment thought, the secularization of society, and modern religious freedom. Which is all really quite curious, given that Luther himself rejected freedom of (outward) religion. The speakers at the panel recognized the incongruity and problems with the master narratives, but they stressed something which has long struck me as a curious idea: German academia differentiates between “historians” (sometimes charmingly called “profane historians”) and “church historians.” The latter are members of theology departments and have the background this implies, meaning that they have experience with biblical exegesis and at least a working knowledge of Greek and Hebrew. “Profane” historians, on the other hand, are situated in history departments, and are more likely to be conversant in Foucaultian abstractions and the theoretical concepts of cultural and social history. The participants in this afternoon’s panel repeatedly pointed out that they represented two different disciplines. From my perspective, this can become a problem when cultural and social historians are expected to address their subjects from a “secular” perspective, and church historians scoff at social history as having deconstructed the religious content of the Reformation (as I saw happen this week). Indeed it was in part my sense of this tension that discouraged me from pursuing an academic career in Germany: my interests in religion meant that my research fit more naturally into religious history, but my lack of theological credentials precluded me from positions in those departments. The problem remains, however: it is impossible to understand the development of the Church without considering the social and cultural factors which played a role, and it is impossible to understand the social and cultural environment of the sixteenth century without considering the religion that pervaded these societies. My sense is that this dichotomy is at least somewhat less pronounced in the United States, but I haven’t fully developed a theory of why this might be. Undergraduate colleges typically require all students to take some history courses, and “Renaissance and Reformation” or “Western Civilization” surveys are typical classes offered to fulfill such requirements. Public universities do not house theology departments so any such offering falls to the history department. Ironically, despite this separation of church and state, American society is less secularized than continental Europe, so it is easier for historians to recognize the importance of religion. Whatever the explanation might be, the benefits of discourse which transcends artificial disciplinary boundaries seem evident enough. It is possible to make a valuable contribution to the historiography on the reception of Lutheran ideas without reading Greek or Hebrew. Trying to understand sixteenth-century society without a basic knowledge of the religious traditions, knowledge, and customs which structured the seasons and everyday life is futile. Conceiving of religious history in a vacuum somehow isolated from cultural and social factors is to leave the ivory tower intact. To the extent that Luther intended to spark a debate among theologians with his ninety-five theses, this approach might even be justified. But 500 years of subsequent history have shown that religious ideas have social and cultural repercussions, and there is ample evidence that the influence flows in the other direction, as well. What do you think? I’d love to continue the discussion in the comments below. *This post was written in September on my way home from the Historikertag. I’m posting it while I wait on my flight to return from the American Translators Association Conference in San Francisco.